We will be performing as guests for the “Night of Performing Arts” concert, sponsored by the Church of Jesus Christ of Latter-Day Saints Lynnwood Stake.The theme of the program is “JOY”. We are trying to bring energy, happiness and upbeat feeling by singing “Tanchame-bushi” (Japanese) and When You’re Smiling. There is something for everyone in this light-hearted concert that’s sure to lift up your heart. Hope you can join us! This year’s concert is getting close. This year we are not just practicing music, we are trying to convey a fun, happy, upbeat feeling. We really want everyone to come and have a great time. 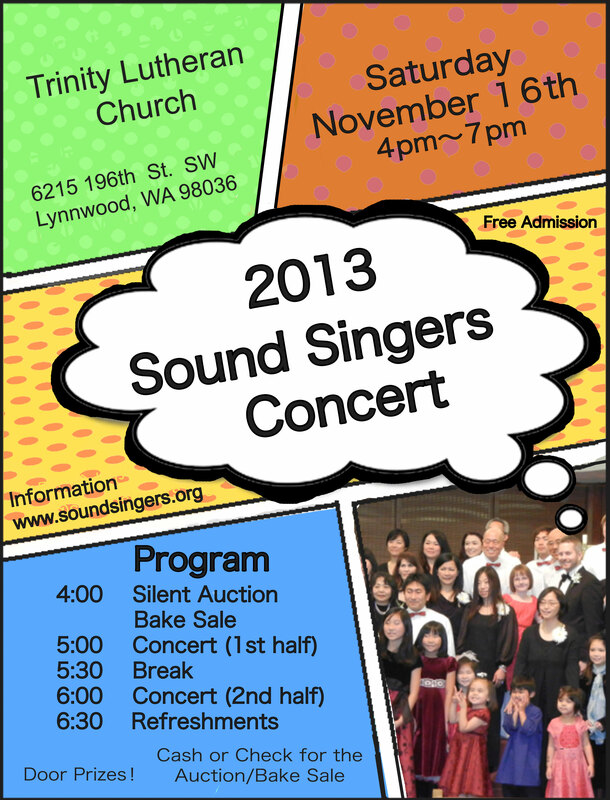 This year, we are going to do a silent auction and bake sale with our concert. We have lots of wonderful items and food for you so come and have fun. There is no charge for the concert so, even if you don’t buy anything there, you can enjoy some great music. Sound Singers wish to express our gratitude to those who attended our Concerts on November 2nd and 3rd. Your generous donations will be used to help people in need. We appreciate you kindness and it is our hope that these funds will “make a difference”. Here is the information on what donations were received and how the money was distributed. Update: we received donations after the concerts and finally sent donations out at the beginning of December. The following report reflects after-the-concert donations. Having just completed our “Inscription of Hope” Concerts we are now looking forward to another great year in 2013. We will be doing some fun music for the rehearsals in November (no rehearsal Thanksgiving day) and then take a break for the month of December. We will resume our weekly rehearsals on January 10, 2013. 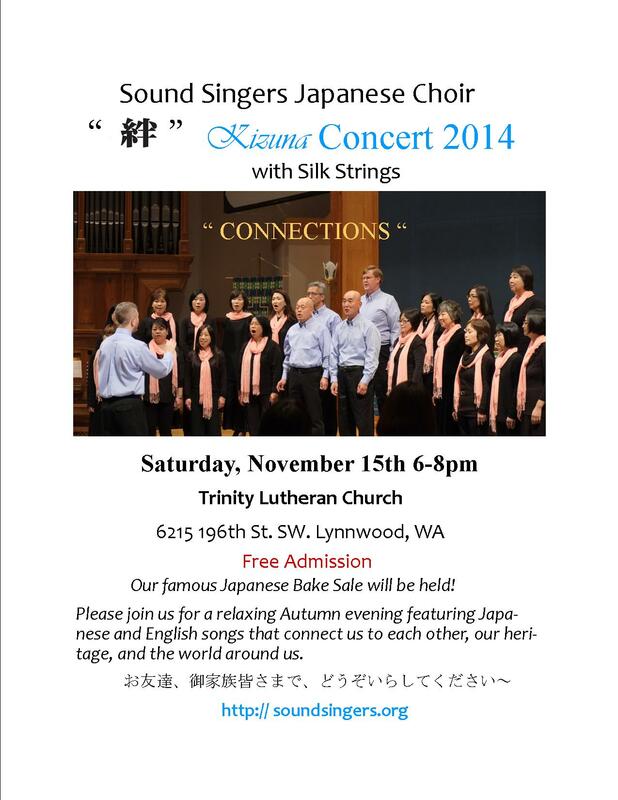 Sound Singers Japanese Chorus is located in the Mukilteo/Lynnwood area of Washington State (about 25 minutes north of Seattle). If you are interested in joining us please visit the “Contact Us” page to get more information. We love making new friends!